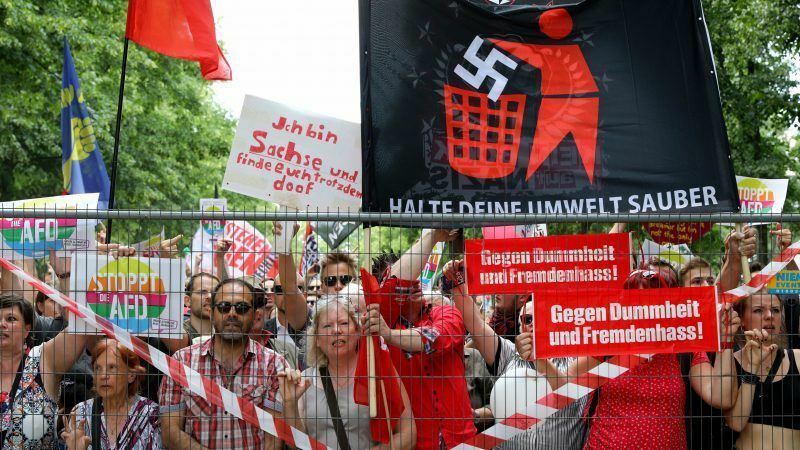 Some 5,000 supporters of the far-right Alternative for Germany (AfD) marched through the streets of Berlin on Sunday (27 May), but they were heavily outnumbered by anti-AfD demonstrations. The AfD’s anti-immigration, anti-European Union and anti-Muslim messages helped it become the third largest party in the German Bundestag in last September’s vote but it has had little impact on parliamentary debate since then. The AfD demonstrators, bussed in from around Germany, marched from Berlin’s main station, down the banks of the Spree river to the Brandenburg Gate near the German parliament. Berlin was treated the surreal spectacle of the Brandenburg Gate once again serving to demarcate two Germanys. But there were around 20,000 anti-AfD protesters – according to police estimates – most of them younger people, highlighting the divisions that have emerged in Germany since the 2015 refugee crisis. Berliners responded with at least 13 registered counter-demonstrations. These included one by the city’s club scene, which put on a techno music party, aiming to “Bass the AfD away” with music blasting from speakers on 20 public address trucks. “We want to be loud enough to drown out the racist speeches,” an activist named Rosa told RBB public television. The thudding techno beat echoed across the city centre on Sunday afternoon. The AfD is now the largest opposition party following the deal between Chancellor Angela Merkel’s conservatives and the Social Democrats to renew their grand coalition. As a result, the AfD, founded as an anti-European Union party by a group of academics in 2013, has a host of powerful committee chairmanships, but has so far failed to capitalise on them. Sunday’s protests were broadly peaceful, with only one minor injury reported amid a heavy police presence.